Description A devout evangelist of Mistra. A beauty who speaks politely and calmly to all comers in tandem with a bewitchingly seductive aura. She travels this land in order to preach the gospel of Mistra to its inhabitants, most of whom have never heard of the god. Although she worships "Divine Mistra", she does not blindly rely on the power of miracles, instead she has a philosophical view of people's beliefs and frames these beliefs as a subject of research. A devout evangelist of Mistra. A beauty who speaks politely and calmly to all comers in tandem with a bewitchingly seductive aura. She travels this land in order to preach the gospel of Mistra to its inhabitants, most of whom have never heard of the god. 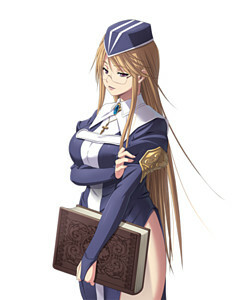 Although she worships "Divine Mistra", she does not blindly rely on the power of miracles, instead she has a philosophical view of people's beliefs and frames these beliefs as a subject of research. [Spoiler] Born into a Mistra-worshipping family, all was well until a new bishop of the faith arrived in her town and began to warp the local church into a fanatical cult deviating from the original principles of worship. After her parents sold her to the Church in exchange for high status in the religious community, Roxane was brought up in the inner sanctum to be one of the bishop's harem upon maturity. However the main church sent inquisitors after hearing of the bishop's misdeeds. Eventually the heretic bishop was killed along with most of his devoted followers, including Roxane's parents. Roxane was then taken in by the church and raised as a sister. Her childhood experience left Roxane wondering about the nature of the gods and whether or not humans could themselves transcend and become divine. Despite all of his heresies, the Bishop was able to use miracles right to the end despite committing countless taboos. Because of her experiences, Roxane sees religion in a very scientific and rational method and attempts to divine its secrets on her travels. A devout evangelist of Mistra. A beauty who speaks politely and calmly to all comers in tandem with a bewitchingly seductive aura. <hidden by spoiler settings> Born into a Mistra-worshipping family, all was well until a new bishop of the faith arrived in her town and began to warp the local church into a fanatical cult deviating from the original principles of worship. She joins Edgar's guild after she is found collapsed from hunger in the street. Despite her slim build, she is capable of eating enough food for four people. Her sexual appetite is just as formidable as her physical one, bolstered after she completes the secret and forbidden rituals of her deity with Edgar's assistance.